- The players will understand how to use their fundamental skills (Passing, receiving, dribbling) to attack different areas of the occer field. 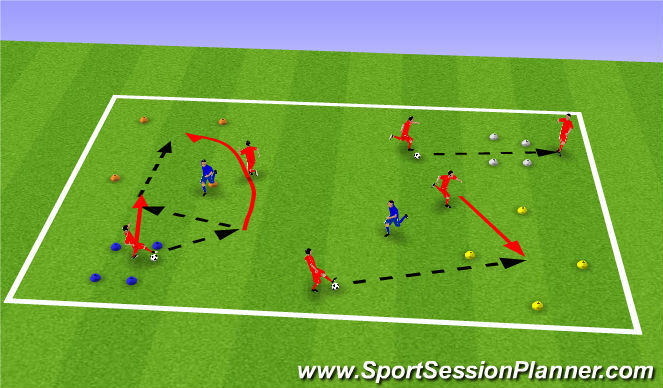 - The players will understand how to practically use their knowledge in understanding different ways of attacking different parts of the soccer field. The taggers will hold a cone and when they tag someone they must touch that person with the cone. Allow the players to change the location of the squares between the rounds. Rep 1 (30 seconds) - Move around the square. HOW can you move towards a teammate and duke them out to go around them? Rep 2 (60 seconds) - Safe zones = any square, only one person per square. Who has any ideas on how to duke out your opponent? Rep 3 (90 seconds) - Safe zones = any square, only one person per square. Rep 4 (90 seconds) - Safe zones = any square. But, when Coach is stood in a square, that square is no longer allowed to be used as a safezone. 2) Are the players looking to duke out opponents? 3) Whilst moving around the square, where else must you be looking? Players get into pairs with 1 soccer ball between two. Players will now have a chance to compete to see who can visit the most squares. When the bandits are introduced, if they win the ball, they must keep it for as long as possible. Rep 1 - How many gates can you go to? If there is someone already in tha square, where else can you go? Rep 2 - Can you beat your score? HOW are you going to beat your score Have a quick team talk with your partner. Rep 3 - Introduce bandits into the activity. Depending upon the numbers of players will depend upon the ratio of bandits to pairs. In this rep, the bandits can only block the square, they can not steal the ball yet. Rep 4 - Bandits can now only steal the ball if the opponents look to play a quick pass through the square. Rep 5 - Bandits can steal the ball anywhere - If the ball enters the square through one side it must exit out of another side. Rep 6 - Bandits can steal the ball anywhere - WHAT will allow you ovisit more squares? WHO and WHAT are we looking out for? 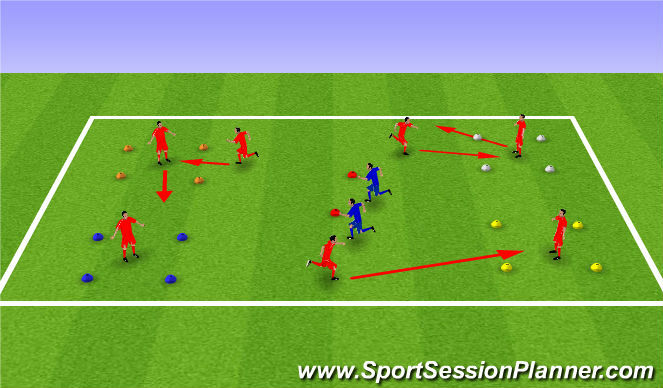 1) How are the players receiving the ball? 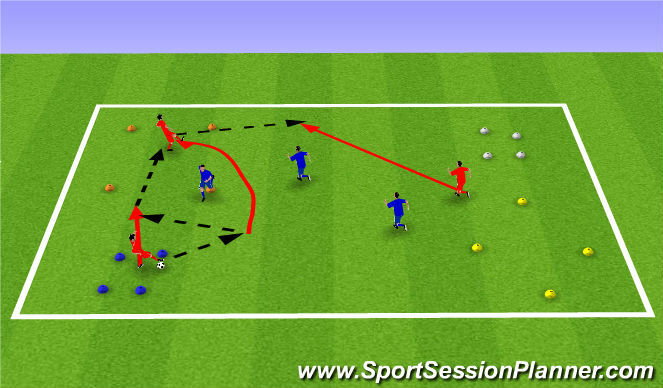 2) How are the players passing the ball? 3) What is the technique when they dribble? 4) Where can they look which will help them? Rep 1 - 4 minutes - Squares are safezones if you pass it into them. Points can be scored by dribbling into the squares. Rep 2 - 4 minutes - Squares are no longer safezones, just a place to score points. You can still score points by dribbling into the square. Rep 3 - 4 minutes - Can only score by passing it into the safezone. Squares are still not safezones. - Where do the defenders drop down to when it is a goalkick? - Where do we attack in our own half? 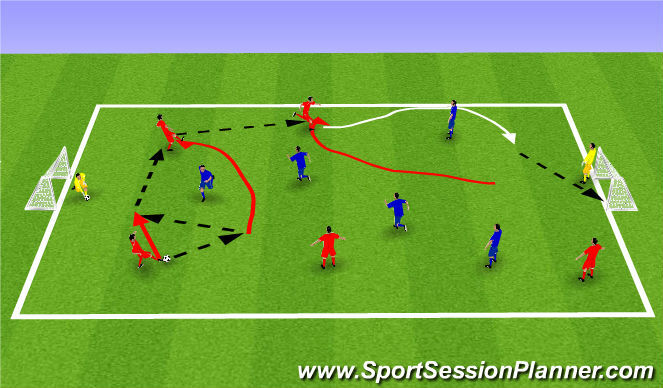 - How can the goalkeeper make it easy for their team mate to receive the ball?